I learned that sometime a life journey can take you to a place that is not on any map. Our Life Journey Program invites you to partner with nature for healing insights and creative restoration. Life Journey sites and suggested reflections are found throughout Charlson Meadows’ 142 acres. For example, are you interested in setting some part of your life free? You may want to visit the Osprey Labyrinth site and reflect on what in you wants to soar. Do you want to enhance your inner peace? Consider walking our Serenity Path. These and other sites awaken self care and healing connections with the natural world. Everyone’s journey is different. Scattered boulders, logs, and benches support sitting still and doing nothing. You are free to discover what calls you, or simply wander the land as you wish. It is your Life Journey. 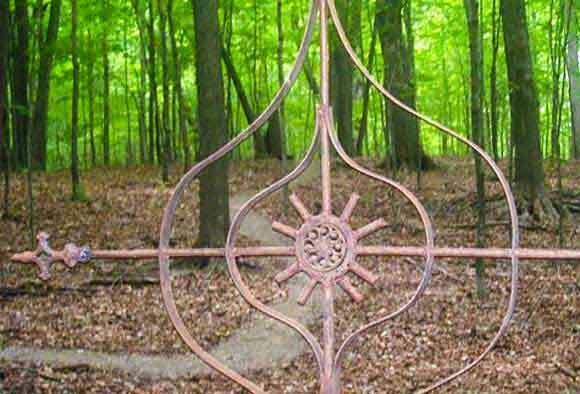 Nature’s Chapel in the Woods is dedicated to the peace and unity found in all spiritual traditions. Silence helps us reconnect to these qualities. Please observe silence as you arrive, visit, and depart. In the beginning God created heaven and earth…And God said “Let there be light” and there was light. Consider the lilies of the field, how they grow. They toil not, neither do they spin…Seek ye first the kingdom of God and all these things will be added unto you. The signs of His power and wisdom are spread out in the heavens and on earth. Just as treasures are uncovered from the earth, so virtue appears from good deeds, and wisdom appears from a pure and peaceful mind. The earth does not belong to man, man belongs to the earth. Whatsoever befalls the earth befalls the sons of earth. Purify Us Wholly. Impart to us those vitalizing forces. that come, O Earth, from deep within your body. Nature can teach us everything. Walk to the center for insights and renewal. Labyrinths are ancient circular patterns that invite people to symbolically leave daily life behind, walk into the center, and contemplate or honor something while in the center. When finished, you walk back out the path and re-enter the world renewed. Labyrinths are not mazes. They are designed to strengthen you rather than puzzle you. 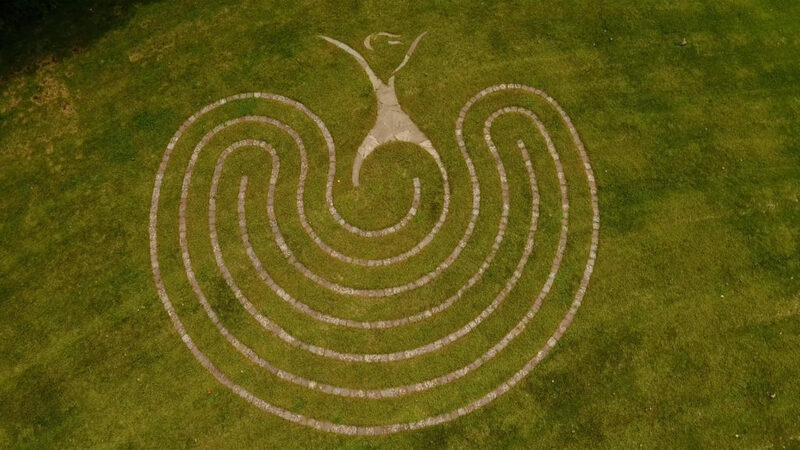 The Meadow Labyrinth is based on a new pattern created by Minnesota’s Lisa Moriarty and Meadow, our gratitude sculpture, by another local artist, Heidi Hoy. This is one of the three labyrinths on the property. Enjoy your journey into the center for rebirth and renewal. Express gratitude for new insights and intentions as you journey outward. Sit in a circle, alone or with others. Recall a favorite place in nature. Re-connecting with nature and the Earth helps us reconnect to ourselves and to others. 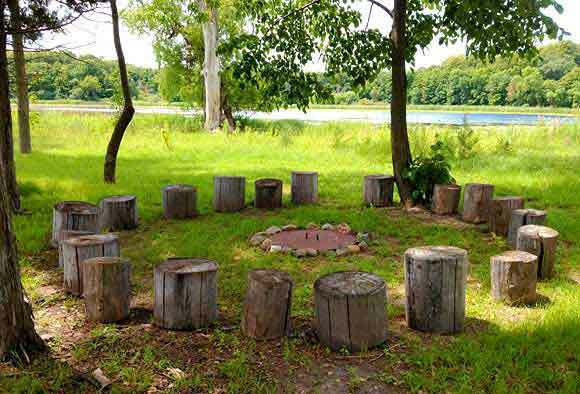 Council Point’s campfire circle and quiet setting invites us to reconnect. Storytelling is an ancient way that others shared knowledge and information. Here you can recall silently and/or share nature stories with others. Tell others (or yourself if you are alone) about your favorite spot on Earth and why it is your favorite. Remember a time when nature’s beauty touched you. What was so striking?